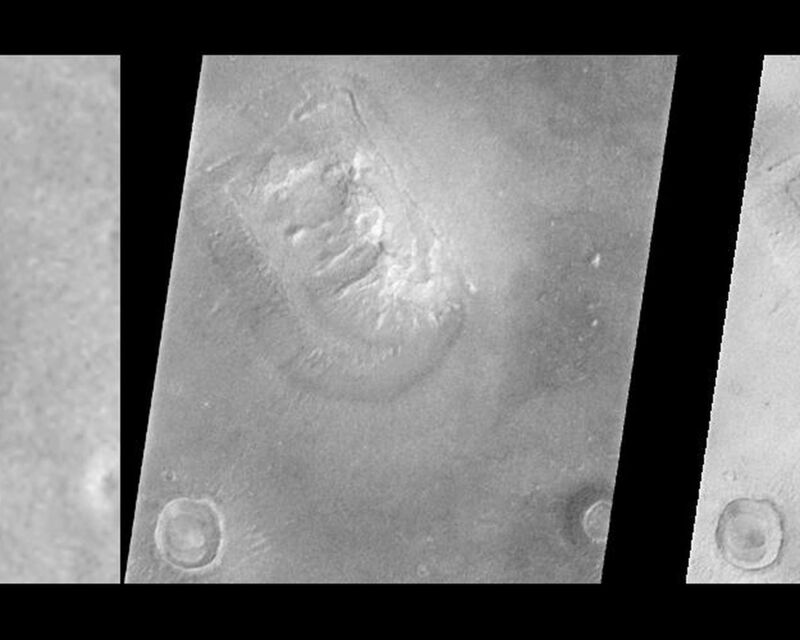 Shortly after midnight Sunday morning (5 April 1998 12:39 AM PST), the Mars Orbiter Camera (MOC) on the Mars Global Surveyor (MGS) spacecraft successfully acquired a high resolution image of the "Face on Mars" feature in the Cydonia region. The image was transmitted to Earth on Sunday, and retrieved from the mission computer data base Monday morning (6 April 1998). The image was processed at the Malin Space Science Systems (MSSS) facility 9:15 AM and the raw image immediately transferred to the Jet Propulsion Laboratory (JPL) for release to the Internet. The images shown here were subsequently processed at MSSS. The picture was acquired 375 seconds after the spacecraft's 220th close approach to Mars. At that time, the "Face," located at approximately 40.8° N, 9.6° W, was 275 miles (444 km) from the spacecraft. The "morning" sun was 25° above the horizon. The picture has a resolution of 14.1 feet (4.3 meters) per pixel, making it ten times higher resolution than the best previous image of the feature, which was taken by the Viking Mission in the mid-1970's. The full image covers an area 2.7 miles (4.4 km) wide and 25.7 miles (41.5 km) long. 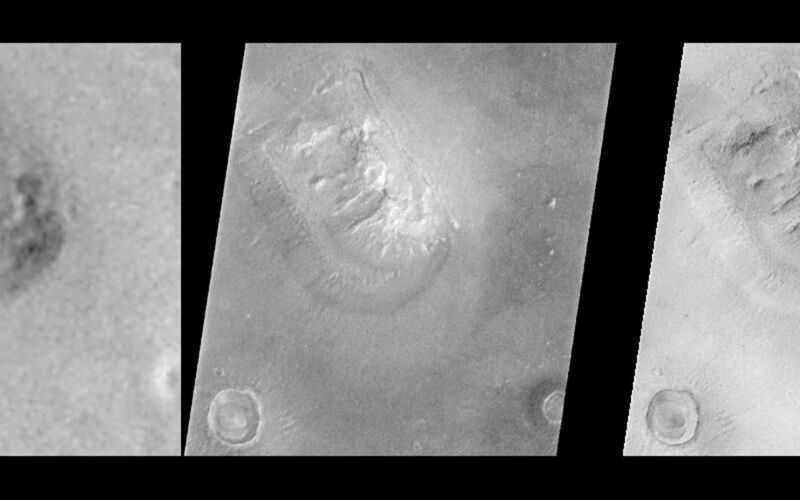 In this comparison, the best Viking image has been enlarged to 3.3 times its original resolution, and the MOC image has been decreased by a similar 3.3 times, creating images of roughly the same size. In addition, the MOC images have been geometrically transformed to a more overhead projection (different from the mercator map projection of PIA01440 & 1441) for ease of comparison with the Viking image. 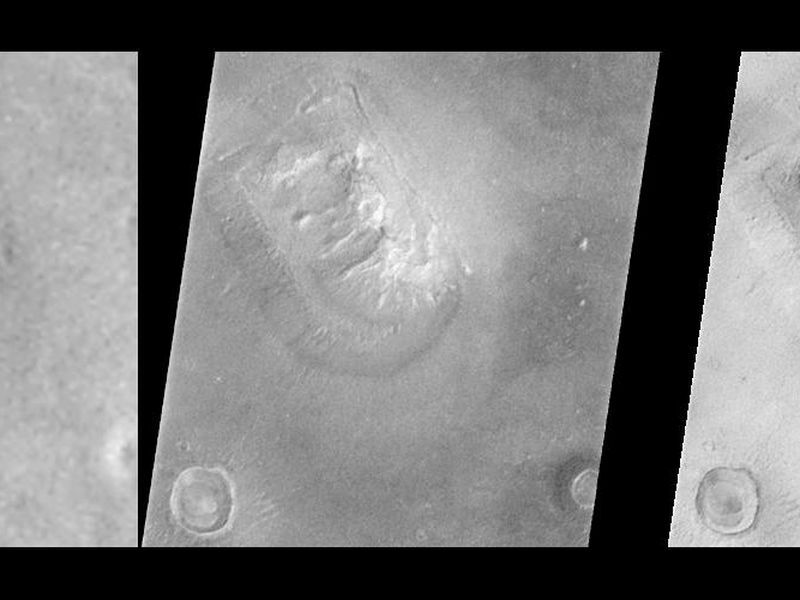 The left image is a portion of Viking Orbiter 1 frame 070A13, the middle image is a portion of MOC frame shown normally, and the right image is the same MOC frame but with the brightness inverted to simulate the approximate lighting conditions of the Viking image. The image was processed to remove the sensitivity differences between adjacent picture elements (calibrated). This removes the vertical streaking. The contrast and brightness of the image was adjusted, and "filters" were applied to enhance detail at several scales. The image was then geometrically warped to meet the computed position information for a mercator-type map. This corrected for the left-right flip, and the non-vertical viewing angle (about 45° from vertical), but also introduced some vertical "elongation" of the image for the same reason Greenland looks larger than Africa on a mercator map of the Earth. A section of the image, containing the "Face" and a couple of nearly impact craters and hills, was "cut" out of the full image and reproduced separately. See PIA01440, PIA01441, and PIA01442 for additional processing steps. Also see PIA01236 for the raw image. Malin Space Science Systems and the California Institute of Technology built the MOC using spare hardware from the Mars Observer mission. MSSS operates the camera from its facilities in San Diego, CA. The Jet Propulsion Laboratory's Mars Surveyor Operations Project operates the Mars Global Surveyor spacecraft with its industrial partner, Lockheed Martin Astronautics, from facilities in Pasadena, CA and Denver, CO.